Bring out the adventure in him! Swing by Treetop Adventure golf anytime, any day and enjoy a round or two of indoor mini-golf, on route to a family fun filled day. Treetop Adventure Golf features two rainforest-themed 18-hole courses – the Ancient Explorer course and the Tropical Trail. Treetop Adventure Golf immerses players in a rainforest environment with 20ft towering trees and a 60ft long colour-changing river. Players will also have to putt their way through moving branches, over 5,600 trees and plants and 550 metres of vines. 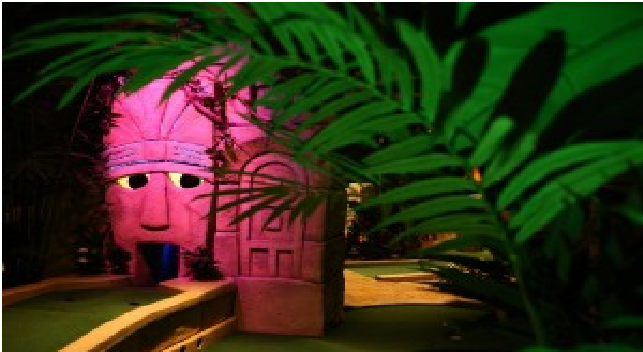 The Ancient Explorer course welcomes players into an ancient empire with the Mystic River, thunderstorm effects, and coloured mist, while the Tropical Trail leads golfers through the Towering Trees rainforest canopy, complete with chattering toucans, singing frogs and a foggy swamp. At the end of a course, players are rewarded with a 19th bonus hole and the chance to win a free round. Treetop’s Clubhouse Bar and Café offers a selection of soft drinks, teas and coffees, as well as locally-sourced beers and bespoke cupcakes. The bar also has a variety of South American themed cocktails and mocktails, such as the Bamboo Cooler, Tropical Smash and the Amazonian Paloma. For £7.50 you could pay for your dad to play 18 holes on Treetop’s Ancient Explorer or Tropical Trail courses, or for £12.50 they can play all 36 holes! A Jungle VIP card for a family of four costs £25. Remember, there’s no need to book, just turn up and tee off – what else could dad want! DRINKS PROMO: Oh My Golf!! Look at our mini-golf mini bar prices. Enjoy Treetop Adventure Golf’s latest drinks promotion that runs every Tuesday, Wednesday and Thursday between 5pm and 8pm. 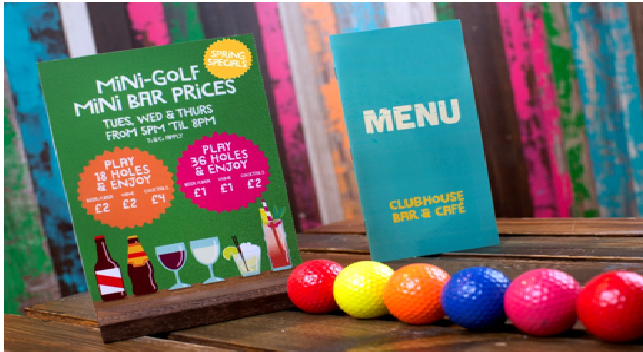 Play 1 or 2 rounds of mini-golf and enjoy beer/cider, wine, cocktails OR spirits from £1. Up to two drinks per person. Ts & Cs apply. *Must have 1 adult, 1 child 12 years or under. *May vary on School Holidays and Bank Holidays. Players can drop in and tee off, and there is no need to book in advance.